Born missing an arm and a leg, Michael "Mike" Power never let his disability stand in his way as a child, solving neighborhood mysteries as a kid detective with his dog Smarts as "Mighty" Mikey Power. However, after a chance encounter with the Action Man, he began to realize there was only so much he could do with his condition. Working tirelessly, Mike was eventually able to replace his missing limbs with mighty mechanical prosthetics of his own design and, after meeting "G.I. Joe" Colton, became valued Adventure Team member the Atomic Man! Mike Power was born in Pawtucket, Rhode Island. Atomic Man profile While he was in the womb, he contracted amniotic band syndrome, leading to him being born without his right arm and left leg. Having to make do with a pair of clunky prosthetics, "Mikey" Power eventually became something of a kid detective in spite of his disability, living by the detective's code and cracking cases all over his neighborhood with the help of his pet dog Smarts. On one such case, he tracked Annie's missing bicycle to neighborhood bullies Pidge and Finney after discovering the muddy footprint Pidge left on his face after kicking him around matched the footprints at the scene of the crime. Later, Pidge reached out to Mikey for help rescuing Finney from the "haunted house" he'd gotten trapped inside. After the two boys and Smarts snuck inside the house, Pidge was quickly scared off by a "ghost" that Mikey soon discovered was actually being created by some sort of "hologram projector". As he investigated it, Mikey was saved from a pair of Brasnyan smugglers hiding out in the house by the British special agent Action Man who'd been tracking them. As the Brit dealt with them, Mikey followed Smarts as he sniffed out where the smugglers were holding Finney, leading to Mikey rescuing him while Action Man stopped the criminals. In reality, Mike Power was alive (albeit on heavy life support) and still being experimented on by Kreiger in an underground facility in Brasnya. Strange Visitors With him now seeming to be more machine than man, Power was connected to the base itself by the Talisman's energies to control the various functions of the facility as well as the dead bodies of Eukarian Transformers Domitius Major and "Shockwave". 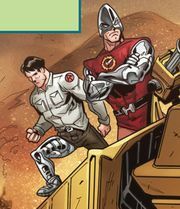 In "Secret Raiders", Atomic Man is seen next to Bulletman, likely a reference to the fact that the original characters formed the "Super Adventure Team." The Hasbro Heroes Sourcebook entry for Bulletman later canonized this name. 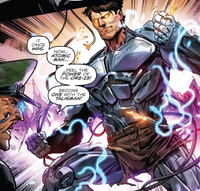 Power's cameo in Duke's memories of his graduation ceremony in the third issue of G.I. Joe vol. 3 isn't compatible with the character's history as presented in the later, post-Hasbro Universe Revolutionaries. This memory having been dragged up by Dr. Mindbender while specifically trying to get a reaction out of Duke may help explain this inconsistency however. This page was last edited on 25 February 2018, at 01:17.